Stephen Chalke commands an enviable reputation through his superbly presented and fascinating books. 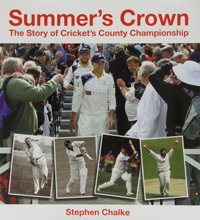 It is not difficult to understand why having read his latest venture, Summer’s Crown, a remarkable tome on the history of the County Championship. There is great joy to be had in reading Summer’s Crown. It is a happy book. It is also an astonishingly thorough account of the County Championship: its winners, remarkable collection of photographs, characters, statistics, miscellany, counties naturally and coverage of grounds old and new. This is undoubtedly the book to read for a detailed account of England’s premier – sorry to those who prefer the game’s shorter formats – competition. Much has changed throughout the years but, needless to say, everything of interest and relevance is in here. I was amazed to see that the book’s price is just £20 and, for this, the England and Wales Cricket Board is to be thanked for bearing some of the production costs. Through their generosity and Stephen Chalke’s diligence and undoubted love for our summer game, readers now have a most affordable and interesting history. Stephen writes that this is not primarily a statistical book but the statistics used are plentiful, relevant, informative and interesting. A statistical book would probably not be ideal for this kind of subject but the balance is, to my mind, spot on. Additionally, participants mentioned are not confined to players. Umpires, scorers, managers etc all make an appearance lending much to Summer’s Crown’s thoroughness. Many will enjoy reading about some of the diverse players who have graced the fields of county matches and added so much humour to the proceedings, Bomber Wells, Lionel Tennyson, Colin Ingleby-MacKenzie being just three mentioned. Cricketers from the colonies, reports from famous matches, fine cricketers of the decades and much, much else all undoubtedly make this a fascinating and remarkable book. The photographs play a great part in bringing county cricket throughout the years back to our bookshelves. I said that this is a happy book. It is but there is an article about the number of deaths on the roads of cricketers travelling between matches and naturally the loss of the lives of cricketers during World War II. The book covers such a wide range of topics including photographs of a ball being hunted in a nearby house’s gutter, training in the Lord’s Long Room, wartime scenes at cricket grounds and the much earlier posed photographs of batsmen (not all with the fabled M.C.C watertight defence). I only hope that I am giving an adequate idea of what Summer’s Crown entails. Each decade starts with some overall statistics but also some miscellany. This latter section is, I must say, quite fascinating and, if anyone was unaware of which cricketer was ruled “out, absent” because he had tried to reach The Oval by the tube to Kensington not Kennington, Summer’s Crown will provide the answer. In conclusion, I cannot recommend Summer’s Crown too highly. Needless to say, like all of Stephen Chalke’s books, it is beautifully presented and one of the best histories of the County Championship that I have read.